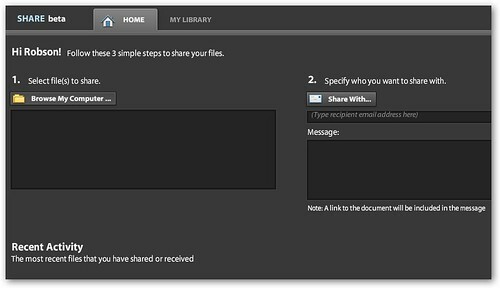 Adobe has just opened up its beta of Share, an online document sharing service. The Flash-based Share lets you easily upload and share any kind of document either with the whole world or just a select group of recipients who you specify. When you upload a file, you can specify the email addresses of people you want to share it with and set access levels (publicly or privately viewable). Once you've uploaded your documents, you can view them directly in your browser and even embed embed PDF and image files on web pages in a neat feature borrowed from Scribd.